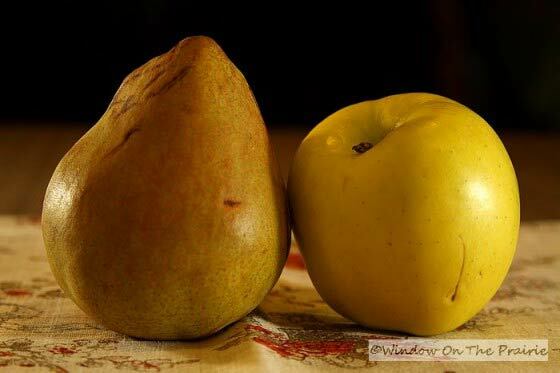 This apple and pear have been staring at me from my kitchen countertop for the last few days. Both of them are looking a little bruised and woe-b-gone. Last night I had a craving for something fruity and warm, so I turned my apple and pear into applesauce…or pear applesauce…or pearpplesauce….or appearsauce. This would make a fresh alternative to cranberry sauce for your Christmas dinner or other holiday meal. core, and thinly slice apples (and/or pears) into a microwave safe bowl. Add a dusting of cinnamon and nutmeg (you can add more later to taste if you like). Add 1 tablespoon water for each apple or pear. Cover with a paper towel, and microwave for 2 minutes. Stir, and then re-cover with paper towel and microwave at 1 minute increments stirring in between until it reaches the desired consistancy, and adding more water if needed. Two apples takes about 5 minutes. I like a chunkier applesauce. You can microwave yours longer until it’s more saucy and less chunky. This recipe can be modified to make more- just add more apples or pears, cinnamon, nutmeg, and water accordingly. And if you want, you can dress it up with raisins, cranberries, or nuts. You can even add a little heavy cream into your cooked applesauce if you like.